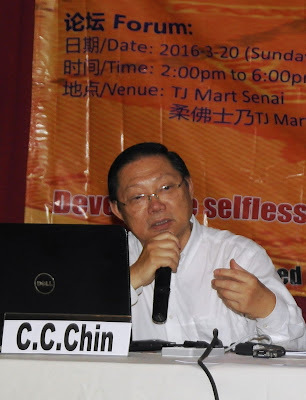 ﻿[Editor’s note] Below is the full text written by Chen Jian (C C Chin, an independent researcher on Singapore and Malaysian Left-wing History, specially for "Tribute to S. A. Ganapathy and Lim Chin Siong: Develop the selfless devotion spirit of these eminent leaders of the Malaya labour movement" forum co-organised by Sahabat Rakyat, Hindu Rights Action Force (HINDRAF) Johor and Parti Sosialis Malaysia (PSM) Nusajaya held on 20 March 2016 at TJ Mart, Senai. Today we are here to commemorate two most distinctive predecessors, and pay our tribute to the great trade unionist and politician Comrade S.A. Ganapathy and Lim Chin Siong! As Mr. Saminathan Munisamy is most expert and shall provide his full comment and appraisal for Comrade Ganapathy, for the benefit of Mandarin speakers, I shall give a brief introduction to Comrade Ganapathy's noble history of devotion for the struggle of justice. Comrade Ganapathy was born in India in 1917, when the parent passed away, he migrated to Singapore and stayed with the uncle. He was deeply influenced by the Self-Respect Movement of India as well as from the Indian Communist Party. Subsequently, he joined the Malayan Communist Party. During Japanese occupation period, he was instructor for the Indian National Army but maintain close contact with the MCP and MPAJA. Most unfortunately, he was arrested by Kempitai and was tortured, and almost be executed should the Japanese not surrender at the time. He was elected as the president of the 400,000 members Pan Malayan Federation of Trade Unions (PMFTU) in February 7th 1947. He led the PMFTU in support to the Pan Malayan Council of Joint Action (PMCJA) for anti British Malayan Union Scheme as well as the Hartal. He had in numerous occasion led the Indian workers fighting against exploitation and suppression carried out strikes against the British Planters. Upon June 20th 1948 the MCP uprising, he went underground. He was captured at Rawang on 1st March 1949, all pleas failed and he was sentenced to death by hanging, his glorious sacrifice mourned by the million and the Indian Government filed a serious protest against the British Government. Today, we pay tribute to him and we forever remember him. 1. Time lapsed, social conditions changed drastically, it's good time for us to put in order and sum up the leftwing history of struggle. The objective is to develop a common view over the origin of the leftwing history and the interpretation and seeking for the true reason of certain major important events, in order to consolidate the consensus in summing up the history of struggle, derive and learn from it the useful experiences and lessons, sorting out and safe-keep the heritage of struggle. Most urgently, in particular, is to sum up, preserve, inherit and persist in the political wisdom of Lim Chin Siong's Line of Struggle. 2. In view of the current segregation and division in the position and stance of the Leftwing, there are various divergent interpretation in the history. We therefore must develop a rational explanation, especially in establishing a common stand in regard to the relationship between the leftwing and the MCP. One must abandon the ill-twisting of history for current interest, equally important, one must get rid of the idea and shall not fall into the so-called official concept in interpreting what is legal so to insist in denying of true historical facts. We must learn and practise Comrade Lim Chin Siong's clear political idea and tactics as well as his wisdom of magnanimity as that were the best lessons merits our highest attention. 3. We must inherit the spirit of Comrade Lim Chin Siong's selfless devotion, upholding the principle regardless whatever adverse historical conditions that may be, his rely on the mass, trusting the mass, organize the mass, mobilize the mass, lead the mass and launch the liberation and democratic struggle in the most favourable, justifiable and articulate conditions. In the long period of time in his struggle, Lim Chin Siong's Line of Struggle had been developed into a well defined line of mass struggle. The era of Comrade Lim Chin Siong and the time that followed were the vital period of the anti-colonial history, Lim Chin Siong's Line of Struggle had proven to be the most effective in the active and positive leadership that had achieved great result. Therefore, in establishing Lim Chin Siong's Line of Struggle is the nucleus task in summing up the political heritage of Comrade Lim Chin Siong. 4. Today, we are in the period of one party dominating as well as racial politics rampancy. Singapore and Malaysian people are struggling for freedom, democracy, justice, human and civil right, Lim Chin Siong's Line of Struggle still has its profound significance and effect of the time, in particular, in the area of organizing the mass, mobilizing the mass and launching the mass struggle, persist in Lim Chin Siong's Line of Struggle is the only approach and the proper course to the current constitutional struggle. It was in the 1950s and 60s when Lim Chin Siong's Line of Struggle was formed, it was during the height of the anti-colonial struggle of the people of Malaya (including Singapore) that had achieved the vital result. Comrade Lim Chin Siong and his team of trade unions leadership was the nucleus force of the leftwing. Due mainly his able leadership that had pushed the leftwing anti-colonial campaign to the highest peak, and subsequently gained the victory to victory. 1. The British Colonial Government declared emergency in Malaya on 20th June 1948, arrested more than 3000 anti-colonial leftwing activists of all races (including more than 1000 Malay leftwing activists) , the Malayan Communist Party and its peripheral organizations, the Malay National Party and the leftwing trade unions, peasant organizations, the youth and women organizations, cultural organizations were banned. Some left inclined societies as well as the only open leftwing political party -- Malayan Democratic Union (MDU) was dissolved voluntarily. Thus, the over-whelming anti-colonial movement during the Peace Period after the WWII went into depression. 2. Beginning September 1948, the MCP in pursuit of and persist in its revolutionary strategies, besides enlarging the scale of the Malayan People's Anti-British Army (MABPA) and reorganized its formation, the Anti-British Army renamed the Malayan National Liberation Army (MNLA), the Malayan National Liberation League (MNLL) was formed and bearing the state's name for encompassing and organizing the general masses into the national democratic liberation campaign, building up and launching the clandestine activities throughout the Malay Peninsula. In Singapore, the MCP had formed a clandestine peripheral organization named the Singapore People's Anti-British League (SPABL). Its developed and nurtured a vast number of leftwing activists, and became the key body of the anti-British national liberation and democratic campaign in Singapore. At the height of it, the membership went up to more than 3000, they filled up the various line of struggle namely the front of student movement, the workers movement, the peasant movement, the youth and women movement, and in the front of literary and arts circles and last but not least the political front. they were the movers of the leftwing movement, they were powerful and dynamic, greatly shaking the foundation of the colonial rule. --- In April 1954, the leading trade union -- the Singapore Factory and Shop Workers' Union (SFSWU) was formed. --- On May 13th 1954, the Chinese student's struggle against the British National Service Ordinance. --- In November 1954, the forming of the People's Action Party (PAP), an united front organization between the leftwing and the Fabian Lee Kuan Yew's clique. --- On 12th May 1955, the Hock Lee Bus Strike anti-exploitation and anti-suppression riot occurred. --- In October 1955, the Singapore Chinese Middle School Student Union (SCMSSU) was officially formed. --- In August 1957, PAP Central Executive Committee election signified the split in PAP between the left and the Fabian clique. --- In September, 1957, the dissolution of the ABL and the MCP clandestine newspaper Freedom News ceased publication. --- On 21 December, 1957, PAP participated the City Council Election, won 13 seats and ruled. --- In April 1958, the MCP representative starting to meet Lee Kuan Yew a couple of time. --- In May 1959, fully supported by the MCP and the leftwing, PAP won the legislative general election by majority. --- In May 1961, the entire united front broke down, the left and the Lee's clique split. the Singapore Association of Trade Unions (SATU) formed, a genuine socialist political party, the Barisan Sosialist (BS) Established. The anti-Malaysia Plan campaign led by Comrade Lin Chin Siong taking its momentum. For all organizations and struggles mentioned above, Comrade Lim Chin Siong gave full scope to the leadership and achieved great effect. He was universally acknowledged as the leader for the left. He led the masses in carrying out the anti-suppression, anti-exploitation struggle and fighting for the basic human right for the workers and peasants as well as for the improvement of basic livelihood of the common people. A major effort was concentrated to the constitutional struggle for anti- Malaysia plan so to achieve the true merger for independence. In the open front, Comrade Lim Chin Siong was distinctive in leading the workers' movement and his enormous capacity and ability was important in achieving the goals and reaching the meritorious gains. Under his able leadership, SFSWU membership rose from a couple of dozen to more than 30,000 with a short span of one year, at the same time, a huge workers bloc encompassed 37 trade unions was achieved. In the rural areas, the rural residents and farmers were united under the Singapore Farmers' Association and in the later stage, they were grouping under the Singapore Country People's Association and the Singapore Rural Residents' Association. In the united front, jointly established the PAP together with the Fabian clique. Simultaneously, the united front strategy also had achieved at the Workers' Party (WP) as well as the Partai Rakyat Singapore (PRS). It was the golden era of the leftwing movement in Singapore. Lim Chin Siong's Line of Struggle was formed and established during these struggles, it became vividly the guideline, the strategy and line of struggle for the open and legal constitutional struggle. 1. Comrade Lim Chin Siong led the constitutional struggle, he knew without any doubt that Singapore is an small isle lack of vast jungle areas as natural defence as well as rural people's material support, it is not possible to embark any form of armed struggle in such commercial and industrial and petty farmers' geographical environment. However, there were political resources applicable and the ample strength of the workers, farmers as well as urban and rural residents to support, logically the solution to the struggle was to follow the constitutional, open and legal political means to achieve the objective for the anti-colonial independent struggle mass movement. In his famous speech " The Task of Current Constitutional Struggle" made on 4th August 1961, he clearly concluded that " the current constitutional struggle is an anti-colonial struggle" and " constitutional struggle is the focused manifestation of the current political struggle", he further declared " the political future development of Singapore.......... would be realized and won over by the path of constitutional struggle", He again stated that " regain the unification of Singapore and Federation of Malaya is the future of Singapore political development", "we shall fight for greater freedom and democracy, strive to free ourselves from colonial rule, gradually create the favourable condition for the nation unification so to regain a unified nation" and " what we shall do is to abide the mean of constitutional struggle to achieve our goal". In 19th September 1962, on the organ of Barisan Sosialis, published a lengthy speech of Comrade Lim Chin Siong on the occasion of encouraging the party workers. It was the crucial moment of anti-Malaysia plan when political situation was tense. In the analysis, he indicated that there were three important principles that must be adhered to, that were " Firstly, should the conditions of constitutional struggle still exist, we must persist on constitutional struggle in peace; secondly, strengthening the solidarity of all races, and thirdly, on the foundation of the workers and farmers' united the majority of the people". 1. Under the limitation of historical condition, should the constitutional conditions still exist, we should persist in the peaceful constitutional struggle principle and path for striving for the freedom, democracy Justice, human and civil right, continue to carry out the national liberation and democratic movement. 2. Targeting the entire people, unite the workers, farmers, petty bourgeoisie, liberal bourgeoisie, majority of the people in carrying out the movement of all people's national civil right struggle. 3. Persist in the mass line of struggle, rely on the mass, trust the mass, organize the mass, mobilize the mass, lead the mass in carrying out the most favourable, justifiable and articulate national liberation and democratic movement in Malaysia and Singapore. Comrade Lim Chin Siong always persist in the line of constitutional struggle, and never deviated away from its principle, he was adamant and steadfast in carrying out the national liberation and democratic movement and the achievement is outstanding. He was seen as the monument for the national independent struggle and the hero of the national liberation and democratic movement, he was signified as the brilliant red flag in the sky. He was detained three times, during which he was not able to lead the struggle personally in the front line, however, there were other comrades followed his line and carried on his tasks. During these crucial periods, there were certain abrupt turns of event in the leftwing movement. 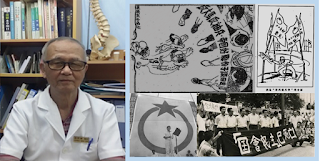 Adding fuel to the fire, there was the Chinese Cultural Revolution bad influence, and most decisive factor was Lee Siew Choh's radical line and the interference of the MCP endorsement to Lee Siew Choh's line of left opportunism and adventurism. during which there occurred a blur situation and the leftwing national liberation and democratic movement leadership ended in loss of direction, and the movement was in a stage of retrogression and disintegration. In a result, there were leftists voluntarily retreated and opted out of the stream. In summing up, this was the period when the main line of struggle was the split and struggle of Lee Siew Choh's line of opportunism and adventurism and Lim Chin Siong's Line of Struggle. Lee Siew Choh was a fanatical egocentric petty bourgeoisie. When key leaders of Barisan Sosialis were put behind bars, being the chairman, he was eager in establishing his power and control in the party and built up his authority as the leader of the leftwing movement. He was continuously chanting out radical slogans and carried out extreme action plans in beguiling the masses and cadres alike, for the purpose in establishing his prestige. These overly left- inclined slogans and actions alike deviated from and absolutely contrary to Lim Chin Siong Line of Struggle, and thus, this factionalized line struggle persist for a couple of years. The most representative struggle was that between Lee Siew Choh's Line of Opportunism and Adventurism versus SCHFEU represented by Tan Sin (Chen Xin) who persisted in Lim Chin Siong's Line of Struggle. It began from the debate of the slogan of "to register on principle" and "boycott the registration" when Malaysia government embarked the national service ordinance. It then followed by the slogan debate of "Withdraw from Malaysia" and "Crush Malaysia" when both Malaysian and Singapore government were in serious conflict. Eventually, Singapore was kicked out from Malaysia on 9th August 1965, Tan Sin (Chen Xin) issued a statement welcoming Singapore independence as "phony". Lee's slogans and the associated actions reviewed that he totally misjudged the situation, disregarded the strength contrast between enemy and ourselves, deviated away from the constitutional struggle principle and condition, simply chanted out overly left slogans and carried out extreme actions, thus misled the direction of the movement. 1. Most unfortunately, the MCP clandestine unit in Indonesia bearing the same line of adventurism, and on three occasion endorsed Lee Siew Choh's line was the correct line, thus it seriously demoralized the will and hampered the actions of the comrades whom persisted in Lim Chin Siong's Line of Struggle, resulted in the leftwing movement landed into a mess. 2. 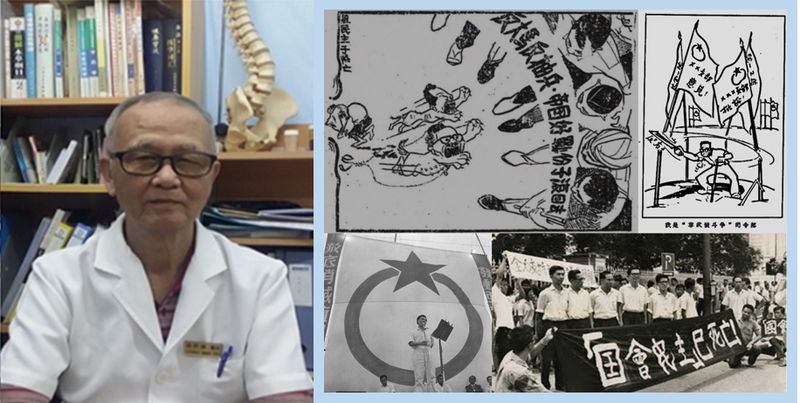 The slogan debate in response to the Malaysian National Service Ordinance led to the severe conflict and split of the left, resulted in Lee Siew Choh and 8 of his followers resigned from the party in May 1964. Subsequently, The MCP clandestine unit ordered the opponents to apologise to Lee and requested them to return to the party to lead the leftwing movement. On 9th March 1965, Lee Siew Choh and the eight followers triumphantly returned as the victors. A series of purging and seizure of power in various front lines occurred thereafter, including the dismissal of several important branch leaders and cadres whom had led or joined force with the Barisan Sosialis 12 branches partition in disagreement with Lee Siew Choh's extremist line. They were all branded as "anti-party" or "against the people". It all happened on 18th October 1965 when 12 branches of the Barisan Sosialis submitted a partition to the party central and demand to convene a forum for discussion on internal democracy and the serious issues on boycotting the election as well as resignation of BS members of parliament from the parliament. In April 1966, Lee Siew Choh issued a series of statements and writings attacking the leftwing trade unions' leaders. At the same time, through his agent or representatives in the trade unions, conducted systematically seizure of leadership of the trade unions. In May 1966, with dishonesty and switching the ballot boxes, seized the control of the SCHFEU leadership. Subsequently, on 30th July, expelled Tan Sin (Chen Xin) and four other from the party, on 20th August, expelled Tan Sin and the four from SCHFEU. This notorious and ruthless act of dissension severely hurt the left's drive in struggle, greatly undermined the strength of the left. 3. The seriousness came about due mainly the endorsement of the MCP clandestine unit. Lee Siew Choh announced in December 1965 that Barisan Sosialis to withdraw from the parliament, and to embark mass struggle on streets. This action seriously violated Lim chin Siong's Line, destructed all political gains through years of struggle, abandoned the mass line bitterly built by the left, and blindly embarked a line of extremism that would not rely on as well as would not engaged the masses. Being a constitutional political party, its depended upon the electorates confidence and trust, to perform supervision and speak on behalf of voters, to criticise or to impeach the ruling authority for their ruthless ruling and regardless the livelihood of the people. Withdrawal from the Parliament meant that this particular political party abandoned its path to constitutional struggle and would only depend upon the street mass struggle for sustaining its political life. This was the extreme behaviour of Lee Siew Choh's adventurist policy and finally it led the Barisan Sosialis into the cul-de-sac, in 1972, Barisan Sosialis lost the heart and mind of the people as well as many faithful followers and vanished from the political scene of Singapore. Today we shall re-examine and review the struggle during that particular period of time in historic prospect. Comrade Lim Chin Siong had provided the most accurate judgement of the political situation at the time and formulated the proper strategies and instruction for the struggle. Due to the fact that Comrade Lim Chin Siong was segregated from the battle front line, the commanding power fell into the hand of the left opportunist and adventurist, the struggle was then deviated away from the set objectives and lost the direction, finally led to a total failure, this was a lesson to be learnt, the bitter failure experience should be a warning to us. Since the 1990s, the national liberation and democratic movement has entered a new era. The atmosphere of races politics in Malaysia has disappointed all political parties that intended to be multi-races parties gradually turned into parties of mono race. This is sad but was the real fact of Malaysian politics. In reality, due to the rampant oligarchy, institutionalized corruption, cronyism, all Malaysian share the same fate. All plantation estates Indian workers, the vast number of Malay farmers, fishermen, urban poor suffered an extended exploitation and suppression. The Chinese and urban Indian are not only being marginalized at various level of politics and economic, but also facing the problems of basic survival and development. The accumulated anger eventually forced all races of all strata to unite into a decisive show of force. By mean of a one man one vote system, a tsunami show down were realized during the 2008 and 2013 elections, it helped the birth and the establishment of a two parties system. On the one side, we notice that the political situation developed and forced all suffered races come together, created such powerful effect that shakes the ruling elites. But on the other side, we are sad that the racial politics still imposes shocking influence, this of course is the detrimental effect of the racial politics still in the working. In foreseeable future, racial politics may still sustain, in particular the dominancy of the Malay chauvinism in the main stream politics will still post as the obstacle to the surpass-racial politics. From the objective and optimistic point of view, we shall not under estimate the Malaysian civil right movement, it originated right after the “Operation Lalang” when members of the democratic activists saw the urgent need to be protected. It was born with effect of the struggle against the ISD, the raising political consciousness and conscience of the people and daring to fight help in the creation. We dare say, if there would be a civil body that would surpass racial and surpass political party, it would be the human right and civil right organizations. Therefore, these human and civil right organizations must bear the responsibility for the struggle and to organize and to mobilize the masses to strive for the freedom, democracy, justice, human and civil right in Singapore and Malaysia. In facing ever more complex political situation, one must be more tactful in its tactics and strategy, especially be alert and be vividly clear of the political situation, master the direction, be prepared of strategy and tactics, most importantly, one must initial a clear line of political struggle. We notice that till to-date, the civil right bodies didn’t formulate and establish a clear vision of a line of struggle, not to mention that the existence of a mass line. We are here today paying tribute to two eminent leaders Comrade S.A. Ganapathy and Lim Chin Siong. We are to commemorate Comrade Lim Chin Siong 20th anniversary of his departure. We would like to sum up and signify their noble contribution to the workers and political movement and reaffirm the establishment of Lim Chin Siong Line of Struggle, of which we inherit and to persist in, it is the best guidance and direction we pursue for the struggle of the national liberation and democratic movement of Singapore and Malaysia.